Hmmm.... I'm not sure about these. I had a chance to play with my green scraps recently and this is where I started. I did sort the scraps by value/colour to begin with. This is the first go around, with predominantly light greens. My overall concept is to have light and dark areas, to mimic the race of light across the mountain meadow. I don't want each area to be a solid block though, that's why there are some dark bits mixed in. The dark blocks will be the opposite. This is also the beginning of adding in the idea of flowers in the meadow. In a real meadow the flowers are small and scattered across the hill, that's why there aren't many here. I've got some pink, yellow, orange, and white scraps set aside to make more flowers. However, I'm not sure about these. Maybe the green chunks are too big? Maybe it is too random? 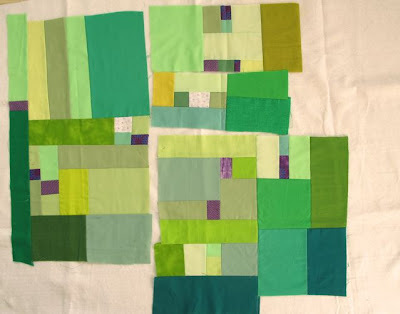 Should I stop being so literal with my interpretation and make these blocks instead of one giant slab quilt? What I do know is that I need to play a little bit more before I make any more judgements. Hi!!! I really like it!! I like the random scattering of flowers!! Have fun!! I really like the way this is looking...who knows where it will take you. oh, the excitement of working improv. I think it looks very promising. YOu can see depth with the mix of colours and sizes. I like it. Until I read your description I thought it was pretty cool looking and fun. After reading about your interpretation its even cooler. Hey are you going to be at the Creative Stitches Show Friday? I see continuing and then... add applique flowers! Similar to the effect of Leaves and Vines! oh yeah, i like it! keep going! I really love these blocks and the story behind them and what they represent. I can totally see the light moving across a hillside and the sprinkle of flowers in the grass. I can't wait to see more! Oh, keep going! Love the splash of purple, but then again, green and purple are my favorites. This is a great start! Love the little pops of purple! Step back and let it sit for a bit. Maybe it'll tell you where it wants to go. I totally did not think "mountain" when I saw the picture for the first time. I saw fields...the way you might see them from an airplane...and the small purple squares might be homes scattered across the prairie. It does look good, though...just not my personal idea of mountains. It looks like a pretty good start to me. it's uncommon to see a great weblog like this one these days..